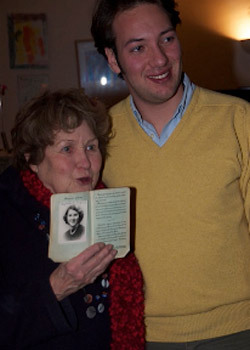 Adventurous Cal alumna Betty Werther was finally reunited with her first passport on Saturday (Feb. 18) in Paris when Portuguese medical student Nuno Fonseca hand-delivered it to her, along with a bouquet of flowers and a red scarf knitted by his 90-year-old great aunt. Betty Werther with the passport Nuno Fonseca (right) found at a Paris flea market and returned to her. “It was such a pleasure,” Fonseca, 23, wrote in an email to UC Berkeley, on whose website the story of Fonseca’s eight-month search to track down 85-year-old Werther was published on Feb. 6. Fonseca, along with a girlfriend and Portugal’s RTP TV crew, arrived at Werther’s home in Paris’s 16th arrondissement, near the Eiffel Tower, on Saturday afternoon. He and Werther, who had not previously met, “embraced warmly,” Werther wrote. At the festive meeting, Werther learned more details about how Fonseca found the 1950 passport at the flea market at Paris’s Charlety Stadium last summer. Among other things, she discovered that Fonseca paid 40 euros for passport, which the vendor insisted was a good price considering the value of some of the visas, including one for Berlin before the Wall. Werther, a native of Ardsley, New York, embarked on a trip to Europe and the Middle East after graduating from UC Berkeley in 1949 with a bachelor’s degree in political science. She recalled how she had initially removed her Israeli visa from her passport so she could visit Arab countries without being flagged by security, and had later taped it back in. “When I look at how the Scotch Tape had yellowed and become more unstuck, I can’t imagine how it went through security,” Werther wrote. She said Saturday’s get-together left her with a new appreciation for Fonseca: “It had occurred to me that everyone knew all about me, but very little about Nuno, the real hero,” Werther wrote. “He also has traveled widely, including in the Middle East — even Syria and Egypt as recently as after the start of the ‘Arab Spring’.” She also learned that Fonseca’s ancestors include the 16thcentury Portuguese explorer Ferdinand Magellan. “This may explain a lot,” Werther wrote, referring to the adventurous spirit that inspired Fonseca’s quest to find the passport’s owner and brought the two together. They plan to stay in touch as Fonseca will be doing an internship this summer at Paris’s Université Pierre et Marie Curie. “He’s really an interesting guy and a very nice person,” she wrote. Since the story about the lost passport was published, Werther has heard from many old classmates and friends.